Over the years, consumers have experimented with a wide array of different cooking techniques. 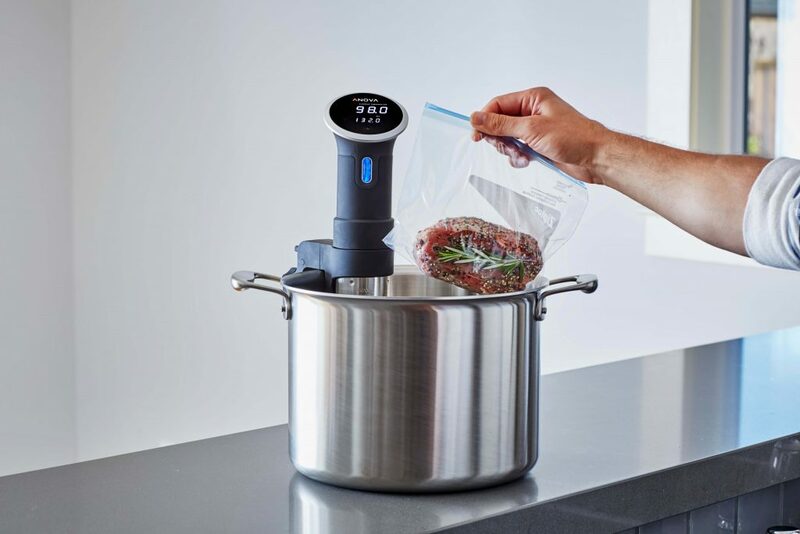 While each has its own set of pros and cons, the sous vide method of cooking is deemed by many to be the best choice. Through this form of cooking, the edibles are stored in airtight bags and placed in a water bath. Alternatively, the bags may also be cooked in a controlled steam environment. Typically, the temperatures remain between 131 to 140 degrees Fahrenheit for a specified duration. The objective is to ensure the inside of the food is cooked evenly with the outside. This guarantees optimum moisture, while also reducing the chance of burning the food's exterior. Truly, sous vide equipment can make an excellent gift for almost any member of your family. Once your loved one has familiarized him or herself with the sous vide cooking basics, they'll fall in love with the equipment. And, they may never use the stove or oven ever again. There are two primary types of Sous Vide equipment, the stand-alone unit and immersion circulator. Both of these units work efficiency, with the operation processes being very similar. To help better understand these machines, each is broken down further. The stand-alone unit does not require any extra equipment, which is why it is highly preferred. This unit provides innumerable benefits, with one of the most notable being quick and easy cleanup. The food items are placed inside of a vacuum-sealed bag and then placed into the cooking chamber. Preset the cooking mode and timer and before long, you will be able to enjoy a healthy, delicious meal. The immersion circulator is a very unique cooking unit that requires an additional pot. The setup is virtually the same as the stand-alone unit, but the sealed vacuum bag is placed in the cooking pot, along with the immersion circulator. The cleanup process is slightly more difficult, but to achieve an enjoyable meal, it will be worth it. When comparing the two cooking machines, the functionality is virtually the same. The only recognizable difference is the design, but the end results will be the same, a perfectly cooked, delicious meal. The market is over-saturated with excellent standalone units. Nonetheless, a few have managed to excel far beyond their competitors. Below, you will learn a little about the two most popular standalone units on the market. The Tribest Sousvant SV-101 is truly the perfect combination of beauty, functionality and simplicity. The all-in-one design ensures the unit is cost-effective and this makes it a great gift regardless of your budget. 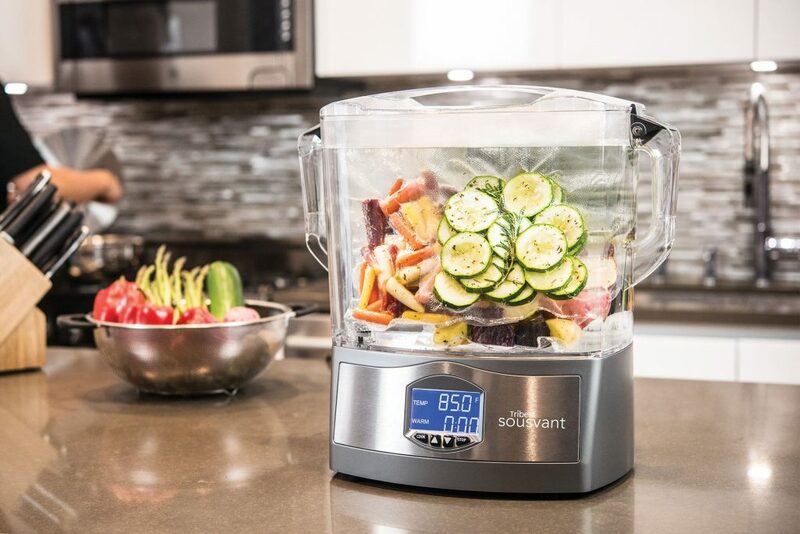 The unit's digital display makes sous vide cooking straightforward and uncomplicated. With a few minutes of fidgeting and reading the included manual, anyone will be able to operate this unit efficiently. The Tribest Sousvant is immensely easy to maintain and it features a handy safety indicator. If power is interrupted, the user will know about it. This ensures unsafe food can be cooked more thoroughly before being served. The insulated housing will prove to be much safer than immersion circulators. Finally, the unit is protected by a 2-warranty. This guarantees it will serve your loved one for many years to come. 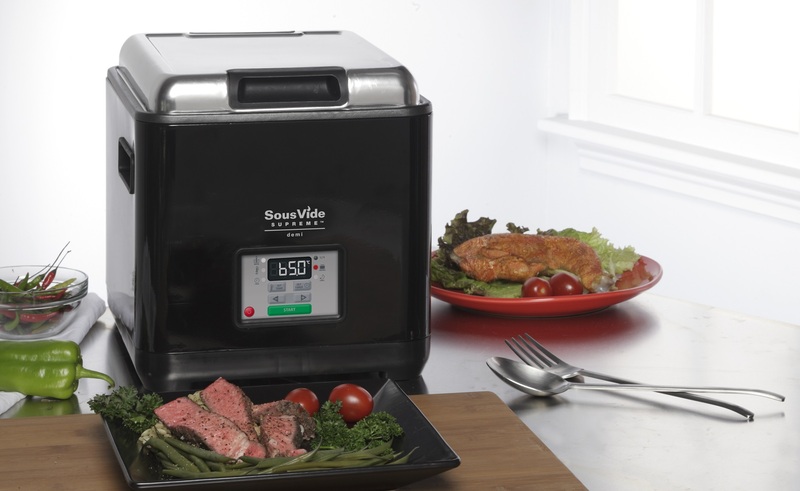 Those looking for an excellent alternative would be wise to check out the Sous Vide Supreme Demi Water Oven. The product is available in two individualistic color schemes, which ensure your gift will satisfy the receiver's design preferences. The unit operates silently, so it can be used any time of the day or night without any problems whatsoever. Utilization of the Sous Vide Supreme Demi Water Oven is truly simplistic. The user can simply configure the settings and leave things be until the cooking process has concluded. Cleanup is also very easy. Just give the interior a good scrubbing and you're good to go. For added peace of mind, the product is covered by a 1-year warranty. While some consumers will prefer a standalone unit, there are some benefits associated with immersion circulators. If you believe your loved one will be better served by an immersion circulator, you will want to check out the popular models below. The Anova Precision Cooker is a highly innovative immersion circulator, which will put a smile on anyone's face. The product's Wi-Fi and Bluetooth compatibility makes it possible for the gift receiver to prepare their food from almost anywhere in the world. The associated mobile application gives the user complete control over the cooker's heat and timer settings. At the same time, the user will receive alerts via their phone. To make the product even more compelling, you can guarantee the Anova Precision Cooker will be suitable for anyone. No additional equipment is necessary, so it is truly a suitable gift for each member of your family. The Gourmia Immersion Pod is a slightly more affordable alternative with a little added personalization. The product is available in several unique color schemes to ensure you can find one that suits each of your loved ones. This immersion circulator is equipped with a convenient clip attachment, which ensures it will remain secured to the pot at all times. Utilization of the Gourmia couldn't be easier. The user can simply adjust the dial and wait for the cooking process to finish. While the Gourmia Sous Vide Pod doesn't feature the Wi-Fi functionality, it is much more affordable and it will get the job done. It is truly no coincidence that it is one of the most popular immersion circulations on the market. The Sous Vide cooking machine will be the most prominent equipment in a kitchen. Every cooking enthusiast, culinarian or professional chef will want to complete his or her cooking gear with Sous Vide accessories. The vacuum bags are a must, since they play a huge role in the cooking process. These bags are designed out of BPA-free materials, so there will never be need to worry about consuming harmful toxins. A vacuum sealer is a necessity and the Sous Vide cooking method provides consumers with two sealing system options. The manual hand pump, with clips is simplistic, but capable of sealing the vacuum bags to perfection. However, if the desire is to complete the process in a time manner, the automatic vacuum sealing system should be on the agenda. Christmas will be here before you know. Now that you have ingested the information above, you should have a good gift idea for at least one member of your family. 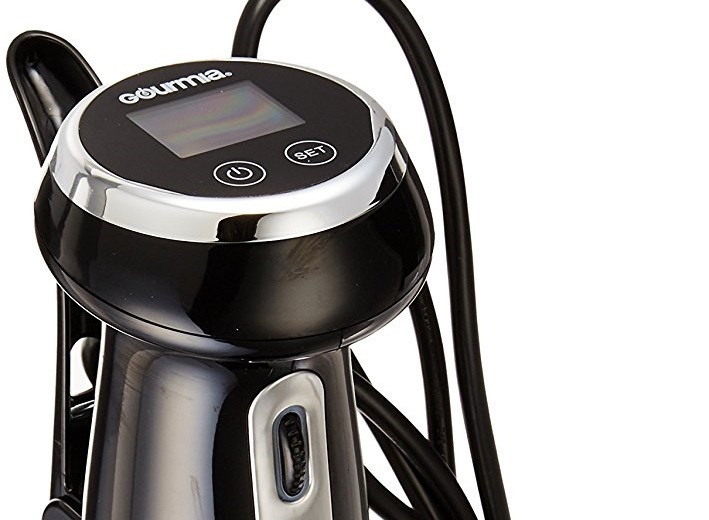 Before going any further, you may want to check out the sous vide holiday gift guide. Remember that standalone units and immersion circulators have a few differentials, but they're also very similar. At the same time, there are numerous factors to consider when attempting to invest in one of these units. To ensure you make the best possible choice, it is recommended that you check out the comprehensive buying guide. Doing so will provide you with further insight to these products, their features, and the different models available. While you're at it, you may also want to consider slipping an accessory or two under your friend's Christmas tree. Put in the effort and learn about these machines a little more thoroughly. This will give you the upper hand and help ensure you put a smile on the receiver's face!